North Korean leader Kim Jong-un has reportedly requested a direct, face-to-face meeting with President Trump to talk about complete denuclearization. In a shocking announcement, the President has agreed to a meeting "by May"—presumably to occur shortly before Israel's 70th anniversary on May 14th. 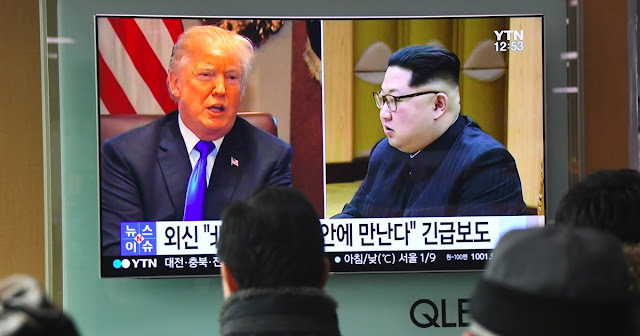 In the meantime, North Korea has agreed to suspend all missile and nuclear tests while conceding that U.S.-South Korean military exercises will continue. The sudden, concessionary tone from Kim Jong-un has startled geopolitical analysts, showing that Reagan-esque "peace through strength" is the only effective method of international diplomacy, but time will tell. One thing is for sure—the last 30 years of Democrat and Neocon policies have done absolutely nothing to dissuade the North Korean leadership. All the while hundreds of thousands—including untold numbers of Christians—continue to languish in labor camps. In other news, rumor is continuing to boil that Supreme Court Justice Anthony Kennedy may retire this summer, which would be a vacancy that could fundamentally transform SCOTUS from socially liberal to socially conservative (Kennedy was the deciding vote on gay marriage and numerous other issues). For the nation's sake I pray he does. I also pray that he stands up for religious liberty in the upcoming, monumentally important case involving a Christian baker in Colorado who refused to bake a cake for a gay wedding. If he sides with the court's four liberals, Christian liberty will be stifled like never before. I also want to bring attention to another rapidly developing story that is being largely ignored—the situation for the minority white population in South Africa has suddenly deteriorated and some reports are suggesting they may be in imminent danger. Please, please pray for this situation immediately. We have readers in South Africa. They and their families need your prayers. Last week the Parliament of South Africa voted to allow the bureaucratic seizure of land owned by white farmers without compensation. To further inflame tensions, the leader of the racist EFF party has called for violence against whites in the country, setting off alarm bells about a Rwanda-repeat. I want to hear from our South African friends if you have any news about this. Lastly, speculation is building about the significance of March 20th, the presumed start of the next biblical year. I would be remiss not to mention this. There is an incredible plethora of numbers, patterns, and day counts pointing to this day, and it's a day that signals not only the end of the year in which the Revelation 12 Sign occurred, but also the beginning of the year in which Israel will celebrate its 70th anniversary. That is significant in and of itself. That being said, I think we can make a mistake by suggesting numbers, patterns, and day counts can only find their significance in the rapture. To the contrary, every day is significant and controlled by God, and some days more significant than others, but sometimes it takes time to realize what that significance is. For example, the Super Blood Moon in September 2015 didn't signal the rapture, but the entrance of large numbers of Russian and Iranian troops into the biblical boundaries of Northern Israel. Likewise, the blood moon in April 2014 did not pinpoint the rapture, but marked a significant number of geopolitical developments and armed conflicts, including the rise of the Islamic State's caliphate and the civil war in Ukraine. While I believe the rapture is imminent (probably this year), I'm not sure exactly how this will all play out. This is a quote from Watchfortheday.org ":the Supreme Court and the rainbow lighting of the White House comes 3-20-18. 9 refers to judgement and here we have a trinity." I forgot to mention thie above comment is in reference to the SCOTUS gay marriage ruling. Amen! And we have a very short time left in which to do that job, so we've gotta get crackin'. As soon as the whole worlds' banking system is ONE and centralized the mark of the beast system can be installed. That's what I was waiting / expecting for years now. Happening in our time. We fly soon. MARANATHA! A pin-point to consider is the number of Chinese troops on the border of NK. Google on that topic and see what you find. pillars of smoke SA citizen, yes pleas pray for us, its a dire situation... BUT GOD!!! would love to draw your attention to a south african man (true prophet) Siener van Rensburg its incredibly interesting! Thank you for sharing. I'm trying to learn more about this situation. I'm a South African. The situation, as Pillars of Smoke has said above, is dire. Afro-centric communists are in absolute control and their dominant intentions are clear. The slow expulsion and eradication of white people from South Africa has been ongoing since Nelson Mandela and his political party were given control of the country. The current recently inserted president, Cyril Ramaphosa, has been quoted in the past as saying that the plan to eradicate white people will be akin to slowly boiling frogs alive in a pot. In other words, a process of time to eradicate white people but done slowly so as to not allow the white people to realize their intentions until it's to late. Julius Malema, the Economic Freedom Front (EFF) leader openly sings about and calls for, at public rallies, the killing of white people. This is nothing new. This has been going on for some time. The previous president, Jacob Zuma, sang similar songs in public and so did, and this may be a shock to some people, Nelson Mandela in his mother tongue Xhosa. White farmers and families are slowly been exterminated and killed in horrific, tragic and cruel ways. In 2018 alone, January and February, there have been at least 119 white farm reported attacks and at least 14 murders that I know of. Farm attacks have been happening for some time. This is a slow war. The world is only in some ways starting to wake up today to the ongoing situation in South Africa. Appropriation of land without compensation is just the latest atrocity. I firmly believe that our calling away to Heaven will happen soon, praise Jesus, but that also this great event will trigger the genocide of any white person living in South Africa that is left behind Charles Taylor-style. The policies and mechanisms to allow for this to happen has been put in place and ongoing since 1994. It is coming to a head now. Boiling point is about to be reached. Come Lord, come and save us! For you are the only one who can do it! Peace. The timing of this is interesting to me. It was just a few months ago we had South African readers informing us about that huge/historic Christian gathering of evangelicals in SA that seemed prophetic in nature and now this. To me it seems to be another parallel to the birth of the Church and the dragon coming quickly to devour the child....... but God intervenes. Correct. I should have rather said an ATTEMPT to commit genocide will be made. I believe they will not succeed. But God! Thank you Robyn! Yes, the world has chosen to ignore this for more than 20 years and now it is only accelerating to a point where tribulation occurs, not just here in South Africa, but everywhere across the earth. Be blessed in the name of our mighty friend and king, Jesus. Yes,I will remember South Africa in my prayers. God bless and protect you. May Jesus come quickly to rescue us out of this terrible world. I have seen none of this news in any of BBC, CBC or (to no surprise) CNN. The water shortage in Capetown are all that I've seen. Thank you for sharing, we will be praying for you and SA. Thank you Richard. MSM will not touch SA with a barge pole. I believe there was a small mention on the appropriation of land without compensation by Tucker Carlson from Fox News the other day.The only ones willing to come to SA to see for themselves about what is happening here for years and report on it are a few handful of independent reporters. Katie Hopkins from Rebel Media and Lauren Southern are two recent individuals that have been to SA and posted their findings on YouTube. He may not be a believer in Jesus but a man by the name of Stefan Molyneux has done some excellent interviews and reporting on what has been happening in SA aswell. I first heard about this in The Blaze. Then I followed up and did some research of my own. My concern is that the EFF's recent inflammatory statements in conjunction with the land seizure law, may give rise to more immediate violence. Just a heads up if anybody wants to know. Apparently yesterday the 10th of March was the day the seizure of private white owned land was initiated where it has been discovered that a government ward counsellor in an area North of Johannesburg invited black people to " claim their land" in certain different areas. It has begun. Everyone in the U.S. needs to sign this White House Petition to allow white south africans to immigrate to the U.S. to escape persecution!!! Thank you for that link! Visited and signed. Signed - Website was "sticky" so be cautious to wait and reload if necessary to get the message you will be sent a verification email. If not, your signature wasn't received. Signed, and praying daily for all of SA! Here is a quote from Kehilanews.com. Israel's Independence Day may be sooner than we think: "The miracle of a reborn Israel took place on the Hebrew date of the 5th of Iyar, 5708, which fell on May 14, 1948. This year, our 70th year of Independence, will fall on April 19. Yes! Seventy years ago this miracle took place for the entire world to see—and for all followers of the God of Israel through His Son Yeshua the Messiah to rejoice in the faithfulness of the One True God! Oh, this would be great indeed if we wouldn't have to wait until May then... I'm so very tired waiting now. LORD have mercy, MARANATHA! Annabel, I read where a former US Ambassador to Israel is very disappointed that the State Dept did not observe this date, April 19, to move the US Embassy to Jerusalem. Don't give up eagerly waiting and anticipating Jesus soon return. And it will be sudden. God bless you. I noticed much criticism against Trump from the liberal left wing socialist media. Comments like he has no experience negotiating with regimes such as North Korea. They are right. He doesn't have any experience selling our country out like previous administrations did. Carter is how North Korea obtained the technology for much of their nuclear weapons. Obama sold us out disgracefully to Iran. That's the kind of experience we don't need. And Bill Clinton sold the Chicoms our missile technology for campaign cash. And he let Bin Laden go several times. And what he did to the Haitians after the earthquake is just as reprehensible. Dear Bernard, please be aware that (I guess) almost none of the white farmers of today may really be born again believers so that there's no more spiritual armour against the witches and sorcerers attack from Satan. I mean this in the sense of Acts 19:15 you know? False Christian converts (of which there are plenty in SA now because of predominant false charismatic churches) cannot win against these evil spirits. Another sign of imminent Exodus. Hold fast, stay firm, MARANATHA! 19Again I say unto you, That if two of you shall agree on earth as touching any thing that they shall ask, it shall be done for them of my Father which is in heaven. 20For where two or three are gathered together in my name, there am I in the midst of them. Anyone else reading this comment, feel free to come into agreement with us. Our Lord Jesus Christ is not a man that He should lie. We just have to believe Him. God bless! My brother in Christ, Bernard: I am continually lifting all of you up in prayer. As I read your description of the atrocities going on in SA, I immediately remembered that John was the only disciple who died peacefully on Patmos; the rest experienced a violent death. Then I remember the Christians martyred in the Roman Colosseum, and the beheadings, burning alive in cages, etc. of the ME Christians today. Unfortunately, true Christians sometimes do experience violent deaths through clearly Satanic means. We don’t always understand the reason God allows these things, but trust that He IS in control, and take comfort in that. I know this from personal experience, as my Christian mother was murdered when I was a child, but I have no doubt that she is in Heaven with Jesus. Hopefully, the petition we are all signing will help the situation in SA, but until then, know you are in my prayers. Kay: You wrote your comment while I was writing mine!! I touch and agree!!! What atrocities! There will be a day of praying ( though it doesn't hurt to start now ). One victim was found with an opened bible on his chest. God have mercy on us all. I just noticed that I’ve never received an email to verify my signature on the petition. I’ve checked my junk mail and nothing there either. Has anyone else experienced this? Without this email verification, my signature won’t count, so I hope someone here has some advice! Robyn, go back and sign again. It won't take effect until you get the confirmation. I had to do it 2 or 3 times, that's why I made the comment above about problems with the site being "sticky", it just wouldn't send the confirmation. Sherry, I had already gone back yesterday about 4-5 times and re-signed, with no email to verify. Just now I went back and re-signed another 4 times, and still no email. Did your email come right away after your last try? Robyn, I got an email verification immediately after signing the petition. You could try a different browser. I'm no techie, but sometimes that works for me. Kay, unfortunately nothing has worked. I tried changing from Google to Yahoo to Bing... None of them end up sending me a confirmation email. But unfortunately, todays black government has erased these types of stories and accounts from schools and, just like there in the US, we have abandoned God and the Bible from our school curriculum. Bernard: What a beautiful story of the power of God!